Is it possible to discern a pattern? One studio album, one (sort of) live album? Whether there is or not, fact is Neil Young + Promise of the Real set a pace many a band can take an example to. Albums fly of the shelf like there is no tomorrow. And yes, Neil Young is moving into his twilight years. This obviously does not make him less productive. More of the opposite. His archives are proving to be extremely interesting and work with his new backing band certainly is more than interesting enough. Having seen their show almost two years ago, a full 3h,37min, I know how intense and good this band is. Paradox is a soundtrack to a film I haven't seen. A lot of the songs are new versions of older work, played with Promise of the Real. 'Hey' is an instrumental of 'Love And Only Love', from the 1990 'Ragged Glory' album, when Young & Crazy Horse were still a formidable force. Feedback and overdrive are all over the guitars. The noise in the studio must have been horrible, the mix on record exactly right. 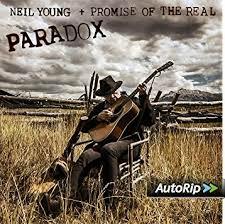 The contrast with the acoustic guitar passage of 'Paradox Passage 2' extreme. The change within that short intermezzo song even more extreme. Here Neil Young is just creating noise, a known hobby of course. Hearing the acoustic 'Digging In The Dirt', I am starting to get the imoression that I am listening to Neil Young and band adoodling away together in the studio, trying out little things, rehearsing a little on route to a tour, picking up an instrument at hand and just play it a little. We're the fly on the wall is my guess. Apparently it was all taped on film by Young's partner Darryl Hannah. Undoubtedly it will give an insight into the way all cooperate, live and play together for a while. Despite the music sounding as if it is all done sort of off the cuff, in between the instrumental little doodling, serious music is made, like 'Peace Trail', where things certainly come together. Even sounding as unofficial as this version does. Slowly but surely it dawns on me that once again I am surprised by Neil Young. An artist I had written off somewhere in the late 90s and certainly early 00s. I haven't bought one of his albums, since then, I think. Yet, somehow a lot of his latest records all resonate within me, without having the urge to having to own them. Which is fairly unique for me I can tell you. Neil Young is one of the greatest artists who started his career in 60s. He has created a unique, extremely diverse oeuvre. Although his heyday is decades behind us, he has grown old graciously and releases albums that remain at a minimum interesting and a lot (far) above that low barrier. Together with the youngsters of Promise of the Real he has found a new level of energy leading to good albums. Tell me that the 'Cowgirl Jam' is not scintillating. Paradox, no matter how informal this album, in part, may seem, this is music with a capitol M. I can't tell you (yet?) about the movie though.